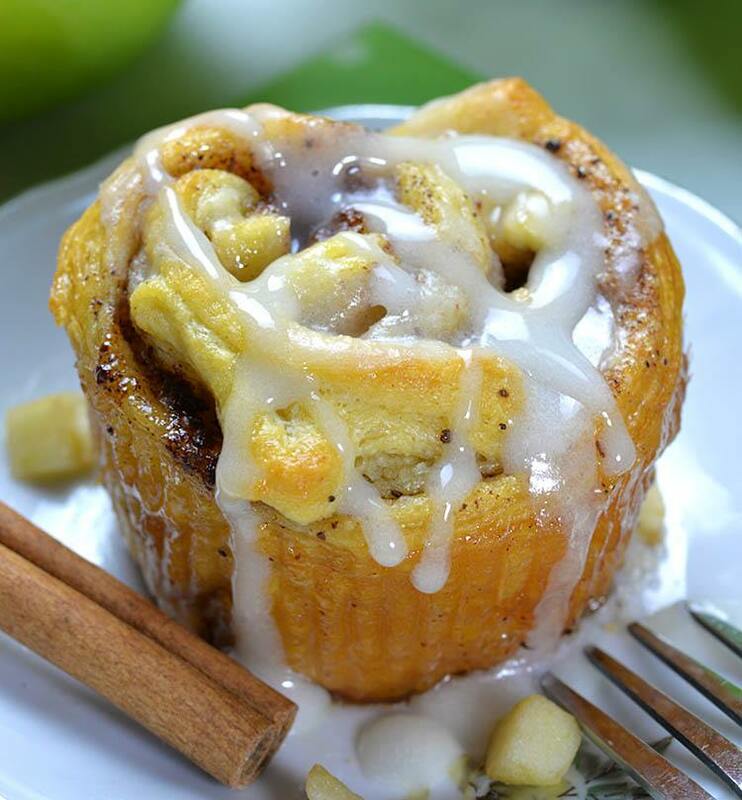 Apple Cinnamon Roll Cupcakes are delicious and easy fall dessert recipe with fresh apples, cinnamon sugar, refrigerated crescent roll dough and maple glaze. 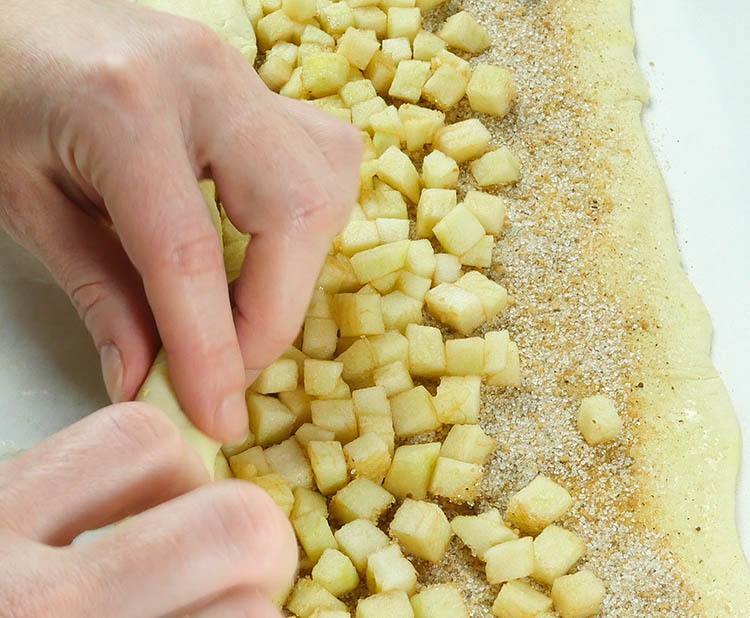 If you have these few simple ingredients, you can enjoy in these sweet, gooey and sticky apple cinnamon rolls in less than 30 minutes!!! Fall baking season finally starts!!! That means a lot of baked goods with pumpkin and apples. If you ask me, I always prefer apple over pumpkin desserts although I love me some Custard Cake year round! Actually I could not wait September and the official start of fall baking season. So I’ve already shared a few fall dessert recipes with apples and pumpkin. 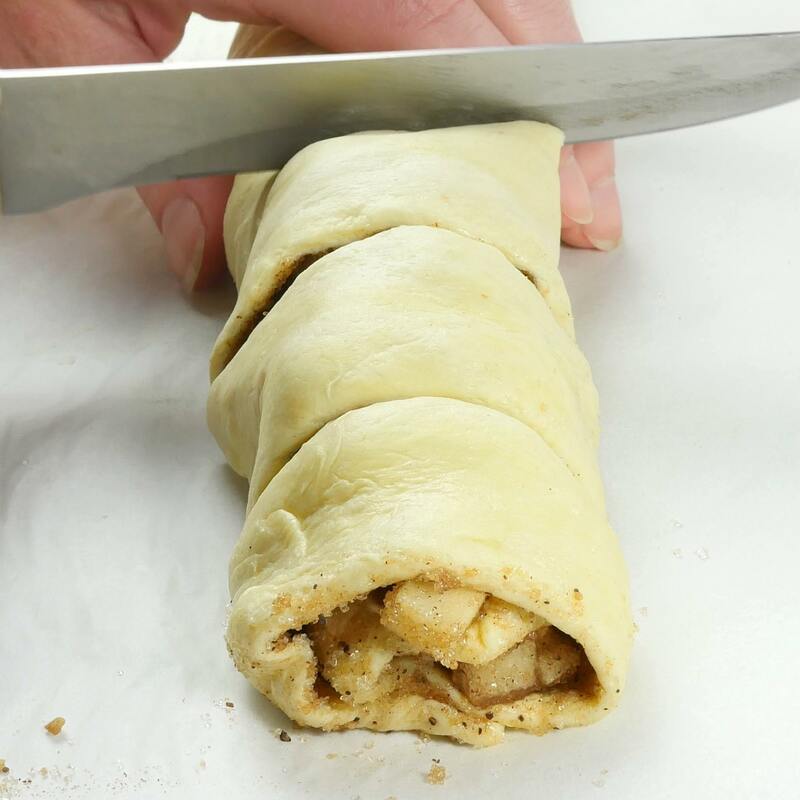 You’ve probably noticed that all of these recipes use refrigerated crescent rolls or cinnamon rolls. Notwithstanding that premade dough save time in kitchen, all of this recipes are equally good for dessert but for breakfast, too. Check my latest apples and pumpkin recipes like: Caramel Apple Cinnamon Roll Lasagna, Pumpkin Pie Cinnamon Roll Casserole, Pumpkin Pie Bombs and Easy Apple Cheesecake Bars. 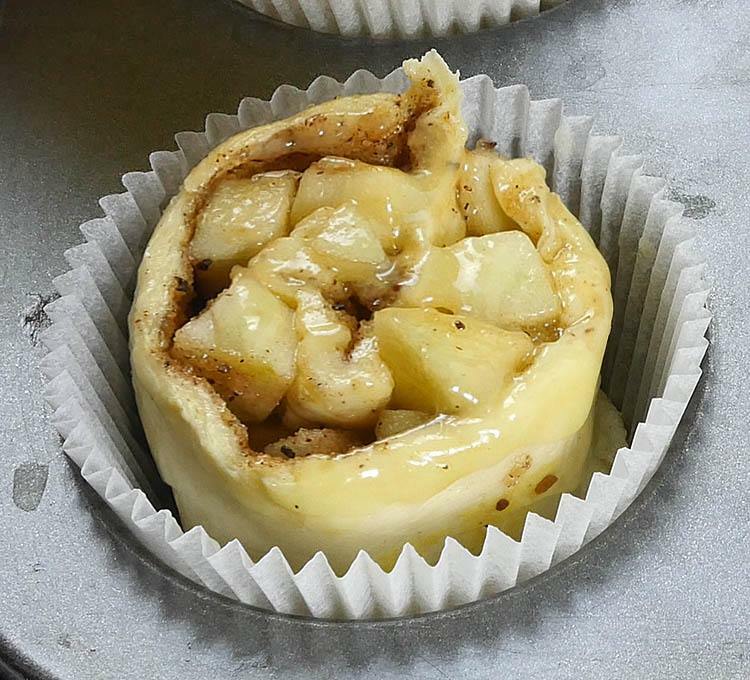 So you can have these delicious Apple Cinnamon Roll Cupcakes as a dessert. But they are totally acceptable as breakfast, too. They have fresh fruit and pastry. Well, OK, I know, they also have a lot of butter and sugar but hey are my favorite fall comfort food. 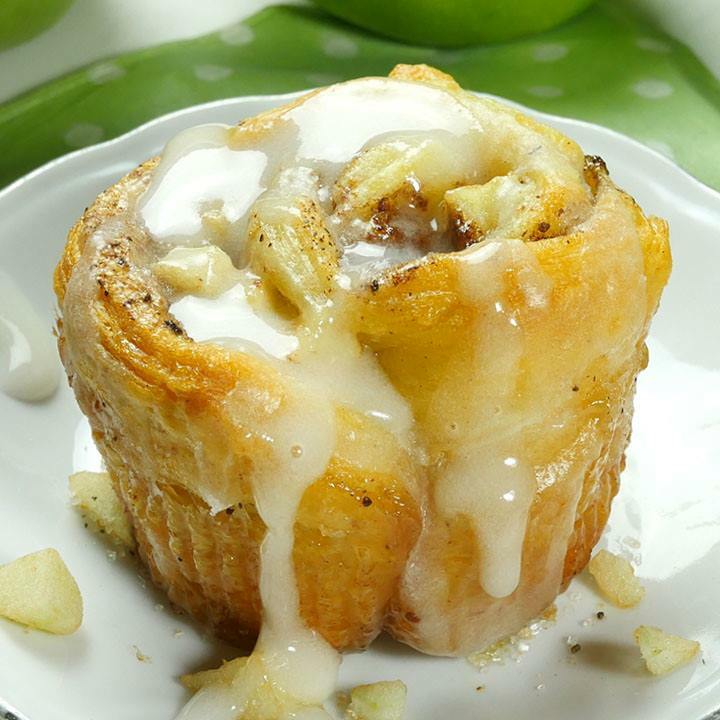 During rainy days when the weather is crisp, nothing can warm you up and make you feel good like these sweet and gooey Apple Cinnamon Roll Cupcakes!!! Just imagine wonderful warm smell of cinnamon and baked apples …I bet you are drooling right now! Choose your favorite and make a delicious Sunday breakfast to surprise for your family this fall. Apple Cinnamon Roll Cupcakes are delicious and easy fall dessert recipe with fresh apples, cinnamon sugar and crescent roll dough. Preheat the oven to 350 F. Line cupcake pan with paper liners and set aside. You’ll have 8 rolls. Slice the log in 8 (1 ½ inch)pieces. Arrange pieces in paper liners. What dough would we need to make if we are unable to buy prepackaged crescent dough. I’m in Australia and have never seen this available. Recipe looks too good to pass by. Hi Maxine, I don´t know what dough you could find there, maybe puff pastry sheet? In the first photo there are 9 cinnamon rolls ( 3 rows of 3) but in the last photo there are only 6 ??? If you double it for a 13 x 9 pan would the baking time be the same? Sorry, my question was for the caramel apple cinnamon roll lasagna!!! Hi Dianna, there are 9 at the bottom, because it should cover bottom and sides. for 9 x 13 pan baking time will probably need more time to cook the center completely, but I haven´t tried. I would like to sell these in my coffee shop. Do you have any idea how long they would stay good in a display case? What do you recommend heating them up lightly in the microwave to get them oven fresh again? Hi Mary, I eat them whole day at room temperature and even from the fridge next day, and these were fine to my taste, but in case yo intend to sell these I think it would be OK to reheat them in microwave. Delicious! What would be the best way to reheat for bunch ladies tomorrow night? Hi Joan, you could use a microwave if you have. I made these delicious cupcakes last week for an event and they were a big hit. I will be using this recipe often, since it is easy to prepare and these are sooooo good. They are also good the next day, taken directly from the frige and heated in the microwave for about 7 seconds. Hi Jo, I did not have the problem with that.I peeled them really easy. Maybe you could tray to spray paper liners with nonstick cooking spray. This is so simple and delicious. My children loved them. The crescent rolls did not hold well but came out good. Hi what kind of apple is requires ? Looks good have to try. How long do you bake? Hi Donna, bake about 15 minutes. The dough looks so crusty on the outside and the apple and cinnamon along with the glaze is so enticing. I really like the idea of making this recipe as cupcakes in paper liners as it makes handling them so much easier. They can also be used as a snack for the kids this way too. Hello Vera. I read all of posts in this blog. I think that this recipe is the best for me. Looks very tasty. If this bread sell in bakery, I will buy them. I really make this so if the first person to make bread, can I do it easily follow the recipe? ?